The fine, high-quality Falbex synthetic filaments used in Blick Mottler Brushes adjust smoothly to any surface, guaranteeing full, even paint application — with no brush marks. 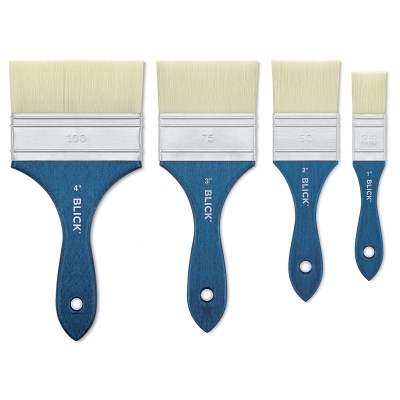 Suitable for finishing and varnishing, these brushes are also ideal for applying chalky paints, for glazing, and for creating large-scale murals. Both fine and heavy-body paints can be applied with these versatile brushes. Every Blick Mottler Brush is equipped with a stainless steel ferrule and an ergonomic handle made from high-quality beechwood. Because of the fine raw materials and stringent production methods employed in their manufacture, Blick Mottler Brushes can be used for both professional and heavy-duty applications. 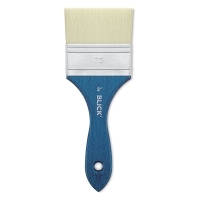 Flat Mottler — The flat shape of this brush is ideal for painting exact lines and covering large surfaces.